Well, all you can say after this one is that itâ€™s been quite a season so far. For as euphoric as the Broncos win was, this loss was just as painful, the second bitter, Sunday-ruining loss in the past three games. But as painful as this loss was, it wasnâ€™t discouraging. Clearly we are a better team than the 9-2 Seahawks: We outgained them 490-355, and had 25 First Downs to their 17. When it counted, we were consistently able to move the ball, and our defense valiantly stopped the Seahawks time and again. I am proud of the way we came up big in big situations, and gave ourselves the chance to beat an 8-2 team in their place. Actually, we gave ourselves three chances. I hope we see this team down the road. The game ended around three hours from this writing, and my homicidal rage at one Jay Feely has somewhat subsided. And while I still feel worse for myself for what he put me through than I do for him, heâ€™s gonna be with us for a number of years so we probably should give him a mulligan on this one. But I sure didnâ€™t like the look on his face when he missed that first Field Goal; in fact, every camera-shot of Feely was discouraging, so that the unfolding of the choke-job wasnâ€™t all that surprising. The 54-yard miss was forgivable, I guess, (although Gooseâ€™s obnoxious interjectory â€œThatâ€™s Short!â€? wasnâ€™t), but being short on the 45-yarder clinched the performance as an all-time gagger. I wish I can say that I hope that he gets the chance to redeem himself, but on the other hand, Iâ€™m not sure I want our season to come down to this guy. And I think I speak for all Giants fans expressing misgivings that weâ€™ve just handed the kicking keys to this guy for the foreseeable future. But in the spirit of Thanksgiving, I think itâ€™s important to point out that that the Giants have been on the positive end of missed Field Goal karma through the years, and that todayâ€™s loss wasnâ€™t the worst way to even the score a little bit in this department. Everyone remembers Norwood, but reading David Halberstamâ€™s The Education of a Coach reminded me of Rich Karlisâ€™ barefooted miss shortly before the half in Super Bowl XXI, which left the Giants unscathed after a goal-line stand and swung the momentum of the game in their favor. Also, David Akersâ€™ missed chip shot in the final game of 2002 enabled us to get into the playoffs in a truly glorious game that was sadly overshadowed by our painful loss to the 49ers the next week. This game is definitely a bummer for the ages, but it wasnâ€™t devastating, and despite losing two of our last three in such painful fashion, things are still looking up in Giant-land. While this hurts us in terms of home-field advantage in the playoffs, it very well might not hurt our chances of winning the East and actually making the playoffs. We have the â€˜Boys at the Meadowlands next week. If we win, weâ€™re in great shape, and if we donâ€™tâ€¦.well, in the words of Wayne Campbell, â€œIt wasnâ€™t meant to be.â€? A celebratory atmosphere pervaded the Meadowlands on this sparkling, unseasonably warm November day: 65 and sunny, with a brilliant 1 oâ€™clock sun and enough of a breeze to keep everyone comfortable. Topping it off were the perfect stooges on the other side of the ball, those hapless Minnesota Vikings, they of the Whizzanator and the Lake Minnetonka Love Boat, a team that managed to come in to this game significantly worse than their 3-5 record would have you believe. Mind you, these were the same Vikings who last visited the Meadowlands on a raw, muddy January day in 2001, where they received that glorious 41-0 shellacking at the hands of the Super Bowl bound Giants. Since then, itâ€™s been a lost few seasons for the Giants, but today the Meadowlands is packed, expectant, and giddy, eagerly anticipating what should be a romp over the lowly Vikings that will serve notice that the New York Football Giants are back as an Elite Team. Itâ€™s been a long time since weâ€™ve expected to win like this, and the Meadowlands is rocking, rollicking, as AC/DCâ€™s â€œHellâ€™s Bellsâ€? rings in the opening kickoff and the second half of what has been a wildly successful 2005. But no sooner had the shouts of the pre-kickoff crescendo left the mouths of the Giants fans â€“ â€œooooOOAAAHH!!â€? — than something strange happens. Willie Ponder, the Giants kick return ace, coughs up the ball when he runs into one of his blockers. A fumble scramble ensues, and jubilant white jerseys and purple helmets herald the news before the refsâ€™ official signal: Vikings ball. This wasnâ€™t supposed to happen, but the Giants reborn defense sees to it that this rare special-teams mishap is quickly stricken from the record, stuffing the Vikings three and out and forcing them into a Field Goal attempt. And when Minnesota Kicker Paul Eddinger pushes his 40-yard Field Goal attempt wide right, the slate is officially wiped clean. The Giants get the ball back and order is restored. But in their first few seriesâ€™, the Giants offense appears lethargic, something that has become a trend in recent weeks. Excepting their blowout of Washington, the offense has fallen off the blazing pace that it set for itself in the seasonâ€™s first few games. And after a couple of stalemating, back and forth seriesâ€™ in which neither team is able to move the ball, the offense gives the Vikings a big break when Eli Manningâ€™s bullet to Amani Toomer bounces off his usually reliable hands and into the arms of Vikings safety Darren Sharper, giving the Vikings the ball at the Giants 17 yard line. Another costly mistake by the Giants, and another golden opportunity for the Vikings. But for as much as the Giants offense has fallen off, so has the defense come on strong in recent weeks; in the previous two games, they have surrendered just six points. And fortunately for the Giants, the D came to play today, stymieing the Vikings again and forcing them into another Field Goal attempt. Another unlikely reprieve is granted when Paul Eddingerâ€™s kick is blocked by unsung special-teamer Damane Ducket. Despite everything, itâ€™s still a 0-0 game. Finally, after a couple more unproductive possessions for both sides, the Giants offense finally wakes up. Sparked by some timely and instinctive scrambling by Eli Manning, the Giants move all the way down to the Minnesota 11 as the First Quarter gives way to the Second. 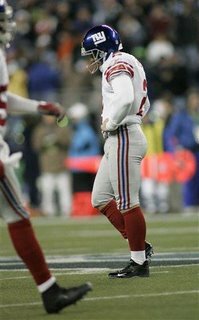 On the first play of the quarter, Eli takes the snap, crisply executes his three step drop, and fires a slant in the direction of his favorite target, Plaxico Burress. 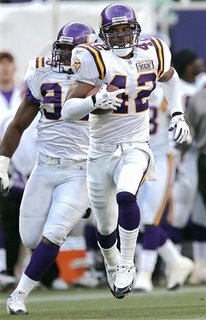 But Darren Sharper, the Vikings wily veteran of a Safety, stealthily jumps the route and snares Eliâ€™s pass for a dramatic interception. From there he is off to the races, sprinting untouched for a 92 yard touchdown, turning what appeared to be a 7-0 Giants lead into a 7-0 Vikings lead. Thatâ€™s a 14-point swing, and thatâ€™s two picks on the day for the old ballhawk Sharper, who has left the Meadowlands so quiet that the only audible sound is the jubilant shouting from the Vikings sideline. But to their credit, the Giants offense shakes off the shock of the interception and goes right back to work. An artistically executed screen pass to Tiki Barber takes them down into field-goal range, and Jay Feely connects on a 35-yard Field Goal to give them their first points. After the Defense continues their dominance by stuffing the Vikings three and out on the next series, the Giants regain possession and string together a series of positive plays. Eli Manning seems to be finally settling into his groove, completing three passes for 32 yards on this drive before the Giants stall at the Minnesota 30. Jay Feely comes in and bangs in a 48-yarder, moving the Giants within a point at 7-6. The teams go into the half with that score, and even though the Vikings are ahead, there is little question who is the better team on the field. It seems only a matter of time before a break or two goes the Giants way and openning the floodgates for a barrage of scoring that would bury the inferior Vikings, who seem remarkably fortunate to be in this game at all, let alone in the lead. And so as the Second half begins, the mood in the Meadowlands is equal parts frustration, excitement, and trepidation. They should win this game, but then again, they should be ahead in this game and not behind. This is still the league of Any Given Sunday; anything can happen in one half of football. Jay Feelyâ€™s kick to open the second half is uncharacteristically short, and is taken on the run by the Vikingsâ€™ Koren Robinson. A wide seam composed of a few picture perfect blocks opens before him, and Robinson accelerates to daylight, touched by nothing but the fingertips of the Giants Jamar Taylor as he breezes 86 yards for the touchdown. A closer look at the play shows that it was the short kick that caused the Giants to overrun their assignments, and they failed to converge in time to stop the decisive Robinson. Another quick, shocking strike, and the Giants are back in a hole. 14-6, Vikings. But the Giants offense comes right back, and on the strength of a 40-yard pass interference penalty by the Vikings Antoine Winfield, they find themselves deep in Vikings territory. On a key 3rd and 5 from the Minnesota 23, Eli finds a wide-open Amani Toomer underneath, who gathers it in and turns upfield, surprised and delighted that the defender who was supposed to cover him had lost his footing some fifteen yards away. Toomer sprints all the way for the score, a touchdown that brings the Giants back within a point. They are sober and businesslike in their congratulatory handshakes, still down a point and clearly on the wrong side of the breaks today. Despite the fact that the Giants have been moving the ball downfield with relative ease while the Vikings have mustered but 6 yards of total offense, the important numbers on the scoreboard still must be overcome. Midway through the third quarter, the Vikings offense almost comes close to breaking through for their first touchdown, but a couple of lucky breaks saves the Giants from giving up their first touchdown since they played the Broncos three weeks ago. 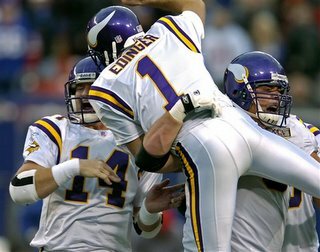 First, on 3rd and 12 from their own 29, the Vikings succeed in picking up a Giants blitz, and Brad Johnson pump fakes before heaving one deep downfield to a wide open Koren Robinson. But the ball is badly underthrown, and what probably should have been an easy touchdown instead becomes a survivable 44-yard gain. On the next play, Johnson goes deep again, this time for the tall, gangly Travis Taylor, who leaps and grabs what appears to be a 27- yard touchdown. But a highly questionable offensive pass interference call on Taylor nullifies the touchdown, and when Vikings Head Coach Mike Tice understandably loses his temper in response to the call, a personal foul penalty is tacked on to the pass interference. Instead of a Touchdown and a 21-13 lead, the Vikings now face a 1st and 35 from midfield. On the strength of these lucky breaks, the Giants regain possession when the Vikings are forced to punt. But a weak three and out on the Giants next possession brings in Jeff Feagles and the Giants punt team. Feaglesâ€™ punt is fielded by the Vikingsâ€™ Mewelde Moore, who breaks two tackles and scoots through an unexpectedly wide open seam before eluding Feaglesâ€™ sorry last-line-of-defense effort, streaking toward daylight and the Minnesotaâ€™s third dramatic, devastating touchdown of the day. The Meadowlands crowd is beyond shocked; having witnessed three of these ghastly touchdowns today, they are simply pissed. 21-13 Vikings. And the next few seriesâ€™ bring even more frustration. While the defense keeps up its brilliance, the offense screeches to an inept halt, alternating futility with self-destructiveness. 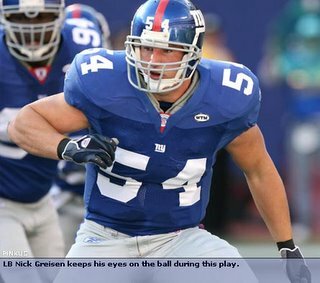 After a Giants three and out and subsequent punt, Kendrick Clancy, who along with William Joseph has provided surprisingly stellar interior line play, forces a fumble that is scooped up by perpetual Johnny-on-the-spot Antonio Pierce, handing the Giants a good opportunity at the Minnesota 40. But the offense gives the ball right back, as Eli Manningâ€™s fade pass to Amani Toomer is easily intercepted by Vikings safety Brian Williams. For those of you who are counting, thatâ€™s three interceptions for Eli today. The Giants defense once again holds up their end of the bargain by forcing a Vikings punt, but after driving to a promising 1st and 10 at the Minnesota 40, an incomplete pass and a brutal 10-yard sack force the Giants into a 3rd and 20, effectively torpedoing the drive. Again, the Giants defense comes up big â€“ itâ€™s really been a remarkable performance today â€“ forcing a Vikings punt that gives the Giants possession at around midfield with 7:53 remaining in the game. This time, the offense finally seems poised to capitalize, as Jeremy Shockey snares a big 20 yard reception on 3rd and 10, and then Tiki Barber knifes his way to the Minnesota 5 on the next play. After a day of fits, starts, and shooting themselves in the foot, the crowd is on its feet, trepidatious but hopeful. 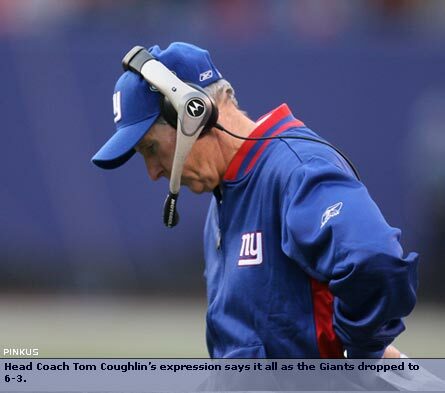 Coach Coughlin calls a middle screen to Tiki, a play that has become a trademark in these types of situations, and the play works to perfection as Tiki deftly follows his blocks and plunges across the plane for the score. But the presence of a yellow flag â€“ or for those of us watching at home, Foxâ€™s yellow â€œFLAGâ€? tab — dampens the enthusiasm. On a day that was characterized by the realization of worst-case-scenarios, Chris Sneeâ€™s touchdown-nullifying Ineligible Man Downfield penalty is just one further indignity. Penalties have become a serious area of concern for the Giants, who have seen these pesky yellow beanbags short-circuit their drives and give their opponents chunks of yardage. Today has been particularly bad in this regard: They have given the Vikings 75 yards on their 9 penalties. But despite the innumerable lapses, the Giants are still very much in this game, and still have a good chance to notch a key touchdown until Manningâ€™s throw bounces off Amani Toomerâ€™s hands â€“ again — and into the opportunistic arms of â€“ you guessed it â€“ Darren Sharper, who dances and reverses his way to the Giants 29 yard-line, yet another crushing blow that the Giants have dealt themselves. With 3:48 left in the game, the Giants hopes are dwindling; they are simply running out of time to have the scoreboard reflect their superiority. But the defense digs their heels in yet again, holding the Vikings three-and-out on a possession that takes a mere 30 seconds off the clock, and the Giants regain possession at the Minnesota 33. Down 21-13, they need a touchdown and a two-point conversion to tie. The crowd rises to its feet as all eyes shift toward young #10. Despite his brutal four-interception day, all 78,637 Giants fans have total confidence in their young hero, knowing that he is at his best when it matters most. And the first three plays of the drive yield 30 passing yards for the re-awakened Eli, and then Tiki Barberâ€™s 11-yard burst on a draw play brings the Giants to the Minnesota 26, and the clock to the two-minute warning. Two plays later, another beautiful screen pass to Tiki goes for 18 yards, bringing the ball to the Minnesota 3, setting up a Tiki 3-yard touchdown plunge two plays later that brings the score to 21-19. The touchdown, it now seems, was the easy part. The offense lines up for two, the crowd tense and quiet. Tiki takes the surprising handoff and follows a strong push by the offensive line — including terrific pull by Guard Chris Snee — and falls comfortably across the plane for the conversion. After an afternoon of frustration, the Meadowlands crowd can finally celebrate, happy in the knowledge that the Giants have battled back from a day of unfortunate setbacks, self-imposed though they may be. And the legend of Eli Manning continues to grow: As he did against Dallas, and as he did against Denver, Young Eli has shown himself to be master of the two-minute drill. At this point, overtime seems imminent, and Giants fans are more than happy to turn the game over to their inspired Defense, which has allowed Minnesota a grand total of 95 yards today in their third dominant performance in a row. The Vikings now have 1:15 left to do what they havenâ€™t been able to do all day long: move the ball on the Giants, as they take over on their own 28. The Vikes long day on offense appears to be continuing when Osi Umenyiora, who has really come into his own as an outstanding complement to Michael Strahan at the other Defensive End, sacks Brad Johnson on the Vikings first play of the drive. The Meadowlands crowd rises appreciatively, spurring their defense to put the clamps on the inept Vikings, forcing an overtime that will allow the Giants to quickly right the wrongs of the previous sixty minutes. But on the next play, Johnson heaves one up that is snared by Jermaine Wiggins over two defenders for a 21 yard gain. Suddenly, the Vikes are close to midfield, perilously close to Field Goal range. Just like that, and the Meadowlands is petrified. They watch in silence as the Giants defense continues its inopportune collapse: Johnson hits an eleven yard pass to Marcus Robinson who gets out of bounds, and then another eleven yard pass to Travis Taylor, who also gets out of bounds, bringing the Vikings to the Giants 33. After moving the ball three more yards, the Vikings spike the ball to stop the clock, and bring on Paul Eddinger for the 48-yard, game winning attempt. Eddinger is 0 for 2 today, having missed a chip shot and having another attempt blocked, which provides the Giants fans with some cause for optimism. The crowd gets to its feet, trying to shake off the punch to the stomach that was this Vikings drive, and muster some will-power that will perhaps give the Giants another reprieve. Eddinger lines up in his signature stance, all twisted around, facing the precise opposite direction from the all-important play that will take place in a few seconds, a play that will either make him hero or goat. The ball is snapped and then spotted. Eddinger turns and thumps a perfect 48 yard-kick, splitting the uprights with plenty of leg to spare. A stunned crowd watches the Vikings celebrate in the Meadowlands dusk. 24-21 Vikings. A final glimmer of hope is afforded to the rapidly exiting crowd when Eddingerâ€™s ensuing kickoff bounces out of bounds, giving the Giants the ball at the 40 and setting up a potential Hail Mary with 10 seconds left. The Giants eschew the Hail Mary, however, in favor of the â€œ86 Lambuth Special,â€? a play made famous in 2001 when Ron Dixon took a lateral from Tiki Barber around the bend for a heartstopping chase down the sideline before getting run down by the Eaglesâ€™ Brian Dawkins. Today there is no such suspense, however, as Tim Carter is buried upon receiving Tikiâ€™s lateral. Game over, a horrible loss, as the Giants slip to 6-3. Despite the fact that they outgained their opponents 405-137, perhaps they are not an elite team quite yet.